Santa Monica’s Shore Hotel may be the new kid on the beachfront, but it’s already established itself as a hot home base for sun-seeking families. Right across the street from the Santa Monica Pier, plus bike paths, walking trails and one of California’s most iconic beaches, it puts the city’s highlights at your feet — literally. You could spend days here and never once get in your car. A short walk across Ocean Avenue takes guests to the beach and Santa Monica Pier. Photo: Skott Snider/Shore Hotel. Although Santa Monica has long been a magnet for those with little ones in tow, the Shore’s minimalist decor doesn’t scream “kid-friendly” at first blush. The warm reception and informal service, though, will set you at ease. Parents get a welcome glass of champagne; kids get sparkling cider and feel equally special. Rooms are on the snug side, but not cramped. Standard rooms work for small families; larger groups can book connecting rooms (six total) or a suite with a pullout sofa. All of the accommodations have private balconies to extend the living space. Ours looked out to the ocean and had a fantastic view of the pier. Surprisingly, street noise was no issue at all — when I closed the balcony door, I could hardly hear the traffic on busy Ocean Avenue. The hotel’s sleek, modern decor features a beach-inspired palette of blues and oranges. To foster a sense of openness and preserve the view outdoors, a glass-enclosed shower sits right in the middle of most rooms, bisecting the bedroom and sink areas. Don’t worry about feeling exposed; you can touch a button to roll down a privacy screen on the bedroom side. The standard rooms have showers only, so go for a suite if you have small kids who need a tub. Sustainability is a major focus here, and it’s well integrated into every aspect. The design features ecofriendly materials and systems as well as low-water landscaping and solar technology. A Green Clean program offers guests a small discount for reduced housekeeping during an extended stay. Route 66 ends at the Santa Monica Pier — one of the stops on the Shore’s “Snap and Savor” scavenger hunt. We tried out the hotel’s “Snap and Savor” package, which is tailor-made for families and includes a welcome gift plus a scavenger hunt for sights and photo ops in the immediate area. (Spoiler alert: You’ll end up at the pier, with passes for lunch and the amusement park, so allow plenty of time.) My 8-year-old loved it, and it was a fun way to learn more about Santa Monica, from the Muscle Beach glory days to the urban renewal project Tongva Park. If you’d rather relax onsite, there’s a solar-heated pool and adjacent hot tub in the front courtyard, shielded from street view by frosted glass. Although we were there on a cold evening, my son kept toasty in the 84-degree water (while I shivered on a lounge chair — clearly he’s smarter than I am). The fitness center is compact but offers all the essentials. The pool area is tucked into an outdoor atrium at the center of the hotel. Photo: Skott Snider/Shore Hotel. A new restaurant/bar is scheduled to open in the coming months. In the meantime, guests can buy continental breakfast items and afternoon cocktails from a small station in the lobby, and the hotel partners with nearby Seasons 52 restaurant for room service. Dozens of other restaurants are within striking distance. We loved Blue Plate Taco, which sits right off the pool area and offers delicious Mexican food in industrial-chic surroundings. Linger for the churros with chocolate sauce — or better yet, get them to go and nibble them on your balcony while you take in a spectacular Pacific sunset. See our full kid-friendly review of Shore Hotel for more information and to check availability. When you use our form to reach out to a hotel for pricing, it goes to them directly for the best available pricing. One of Ciao Bambino’s Family Vacation Consultants will also follow up with you to ensure all quote needs are met. Need Help Planning a Santa Monica Family Vacation? We can help! Our Family Vacation Consultants can provide expert advice on the best accommodations and activities for your family. Request assistance on My Trip Planner. 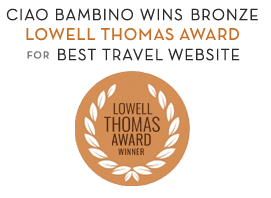 Editor’s Note: Ciao Bambino received a media rate to review the Shore Hotel and the “Snap and Savor” package. As always, our opinions are our own. Photos by Lisa Frederick unless otherwise noted.